While most DC Universe Animated Original Movies tend to draw inspiration heavily from popular comic book storylines, Batman: Bad Blood was surprising since it didn't immediately ring any bells for me when I first heard about it. The idea that seemed most feasible in my mind was Batman going head-to-head with a figure like Dracula, although that vampire has always been a bit more Marvel than DC. I was totally wrong about that and the resulting movie was...interesting, but also a tad confusing at times. I could sense elements from the New 52 Batman but at the same time there was a bunch of other stuff that I wasn't sure how to take in. It's a good thing that these movies are beautifully animated, since the writing has a pattern of being terribly inconsistent. There are great stories and some rather ho-hum stories, and I felt more of the latter this time, especially since they decided to go with an original story. Synopsis: Batman: Bad Blood is a direct-to-video DC Universe Original Movie directed by Jay Oliva. The screenplay was written by J.M. DeMatteis and it incorporates characters from various Batman-related titles around the time of the New 52 reboot. The begins with Batwoman (Yvonne Strahovski) facing a group of supervillains on her own - at least until Batman (Jason O'Mara) arrives to help out. But eventually they encounter a figure known as Heretic (Travis Willingham), who appears to be the leader of the group. In the fight Batman appears to die with Batwoman barely managing to escape alive. Fast forward a few weeks and the extended Bat Family is concerned that Batman still hasn't re-appeared despite their confidence that he should have found a way to survive. Nightwing (Sean Maher) eventually puts on the Batman costume to keep up with the Gotham crime scene and Damian (Stuart Allen) finally returns to Gotham to help find his father. But Batman isn't dead - he's now a prisoner of the villains who seek to brainwash him for reasons of their own. So the story feels like a weird mutant child of many different titles in New 52 Batman. Thus we have elements of Batman, Inc. in the story and characters like Batwing. It was nice to see Batwoman in the mix, and with most of her somewhat controversial backstory intact a well. So there are good touches that highlight each character but at the same time there's quite a lot to juggle and thus not enough time to really help everyone shine to their fullest capacity. The reveal of the villain was a little surprisingly and nicely connected to events that happened in the comics. A lot of the circumstances had to be rewritten to just be Batman-centric instead of being tied to the big crossover arc of Final Crisis or whatever. I don't think the final reveal was maximized in terms of its story potential since their plot did seem a little convoluted or at least rather narrow in focus and terribly centered on the Bat Family. Damian gets a lot of fun lines of course, and that is to be expected. I was expecting more from Nightwing's character, especially once he was fulfilling the role of Batman. Something just felt off there and that was sad. Batwoman had some great moments, but it was clear that the writers needed more time to tell her story fully and give her character a better foundation to stand on. And sadly this was time that the production did not have, I expect. Still, the fight animation remains as gorgeous as ever and even though the story was less than ideal, the fighting makes up for it a lot. Someone really did their homework when the shots were planned out since they went for very controlled and distinct fight moves instead of going for the usual trick of having the action at a pace faster than the eye can follow. And I really respect the director for going this route and making things all the more real, in that regard. 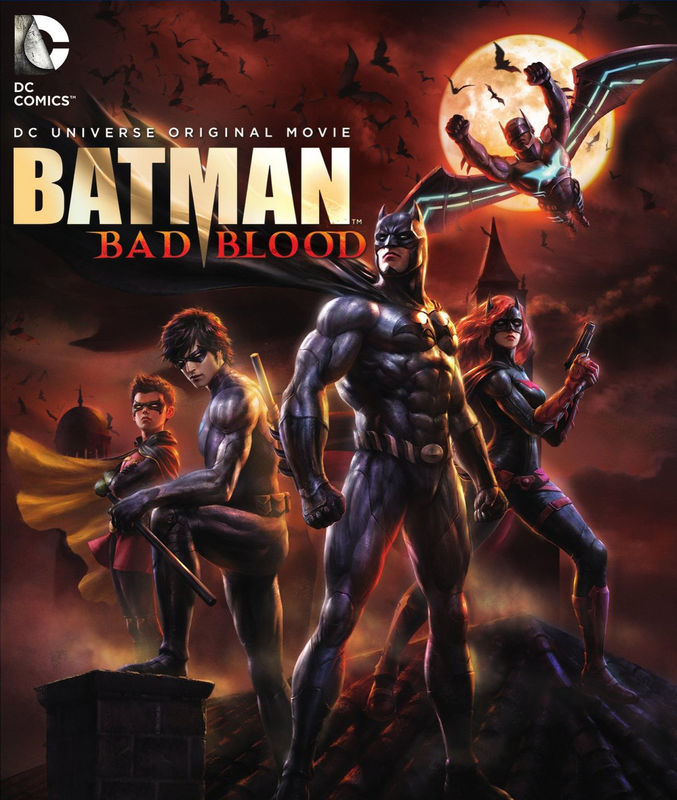 Batman: Bad Blood is a weird addition to the DC Universe Animated Original Movie family that is alien yet familiar at the same time. There's some solid Bat Family moments in the feature that really shine through though and that goes a long way. Thus the show gets 3.5 brilliant fight sequences out of a possible 5.